I have a few favorite books that I faithfully read every year, usually in the fall: Rumer Godden's In This House of Brede; Elizabeth Ehrlich's Miriam's Kitchen; and Laurie Colwin's twin masterpieces, Home Cooking and More Home Cooking. I was in bed with the latter two this weekend (I love writing that), dreaming of comforting things to eat now that the tiniest bit of chill is in the evening air, and now that I am a touch more inclined to make dessert. Like gingerbread. The sad fact is that gingerbread is on the decline, although it is alive and well in the children's books of the fifties, where cheerful housewives wait at home for the arrival of their hungry children at three o'clock, ready with a great big pan of warm gingerbread and some ice-cold milk. You do not need to be a housebound mother to make gingerbread. All you need is to put aside an hour or so to mix up the batter and bake it, and then, provided you do not have a huge mob waiting to devour the gingerbread immediately, it will pay you back for a few days because it gets better as it ages. I myself never have any around long enough to age, but my English cookbooks assure me that a few days make all the difference. Colwin then offers her personal thoughts on gingerbread, namely that the more ginger the better, and molasses should never be used because it is too bitter. She prefers pure cane syrup and endorses that made by the C. S. Steen Syrup Mill. Of course her books were written in 1992 and she helpfully offers the reader the address and phone number of said company. Ten years later, you simply can go to their website if you wish to order syrup. Colwin also advocates Lyle's Golden Syrup which is available in most grocery stores and I myself have some in the cupboard but only because I've made this gingerbread before. Colwin gives two gingerbread recipes in More Home Cooking, and I go with the one from Delia Smith's Book of Cakes, which is called "Damp Gingerbread." I could call it "Moist Gingerbread" and watch the majority of my girlfriends go screaming from the room. But I won't. However I will give you my own little tweaks and modifications as we get down to business and get to perfuming your kitchen. Preheat oven to 350. Grease a baking dish with butter or spray with Pam. Pour syrup and butter onto dry ingredients and mix well. Add egg-milk-ginger mixture and mix well. 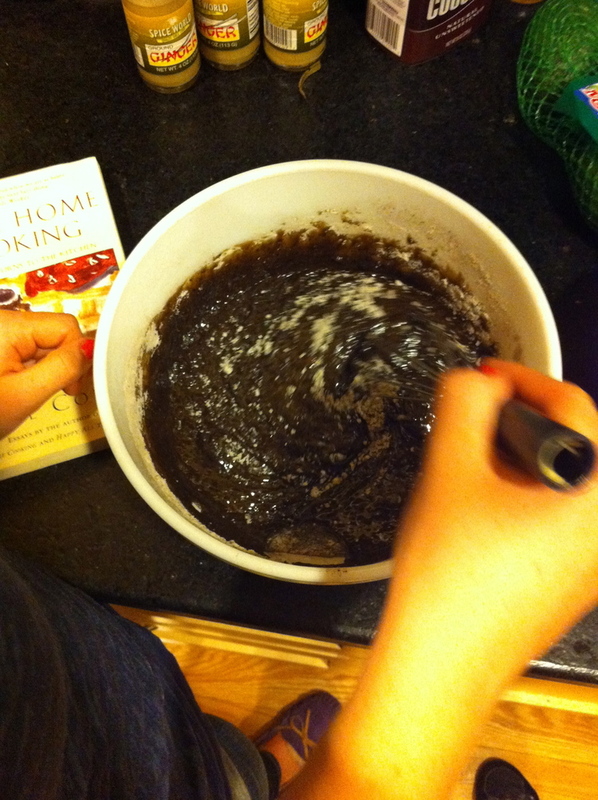 The batter will be very liquid: this is damp gingerbread. Pour into baking pan and bake for 50-55 minutes until the middle is just set with the edges pulling away from the sides of the dish. Your kitchen is going to smell amazing and don't be surprised if you feel inclined to string up some lights and create a holiday station on Pandora. At the very least you should light a candle. Cool for ten minutes before turning out. Serve with a dollop of whipped cream, vanilla ice cream, or just eat it straight out of the pan. Try to save some, wrapped in foil, because it really does improve with age. *Funny story about bottled ginger: I was in Stop & Shop yesterday, trawling the produce section where I know they keep those jars of ginger. They are usually on the lower shelves beneath the bins, cozied up with the bags of apple chips and the jars of minced garlic and the bags of pine nuts. But they weren't there. I scoured every last lower shelf and then went over to the ethnic aisle, thinking maybe they'd moved in with the Asian ingredients. No, not there either. I checked the produce section one more time and then finally asked a clerk. He wrinkled his eyebrows, asked if I didn't mean ginger root? No, I said, it was bottled fresh ginger. He asked another clerk. Clerk2 said yes, the bottled stuff, he knew what I meant but he hadn't seen it stocked lately. Had I tried the ethnic aisle? Yes I had. Clerk2 apologized, as did Clerk1, and I thanked them both and moved on. As I was passing the refrigerated display of bagged lettuce and other salad stuff, AH-HAH!!! There they were! Hiding! "Hey!" I called out happily to Clerk1 and Clerk2, holding up my prize, "Found it!" And they just seemed really happy about it, and apologized again for not knowing their own section. They were cute. It's these little things that make your day.